EUR/USD edged higher ahead of the second round of the French elections. Does it have more room to the upside? Apart from the elections, we have GDP and other events from the old continent. French elections round 2: Sunday, exit polls are at 18:00 GMT and real results will trickle around the market open. German Factory Orders: Monday, 6:00. Sentix Investor Confidence: Monday, 8:30. This business survey has advanced nicely in recent months, reaching 23.9 in April, beating expectations for the fourth consecutive month. German Industrial Production: Tuesday, 6:00. German Trade Balance: Tuesday, 6:00. French CPI (final): Tuesday, 6:45. French Industrial Production: Tuesday, 6:45. French Trade Balance: Wednesday, 6:45. ECB Economic Bulletin: Thursday, 8:00. Two weeks after Draghi was optimistic about growth but unsure about inflation, we will get more data from the central bank, the data they used for making their assessments. EU Economic Forecasts: Thursday, 9:00. German CPI (final): Friday, 6:00. French Non-Farm Payrolls: Friday, 9:00. Last edited by 1Finance; 05-06-2017 at 07:50 AM. 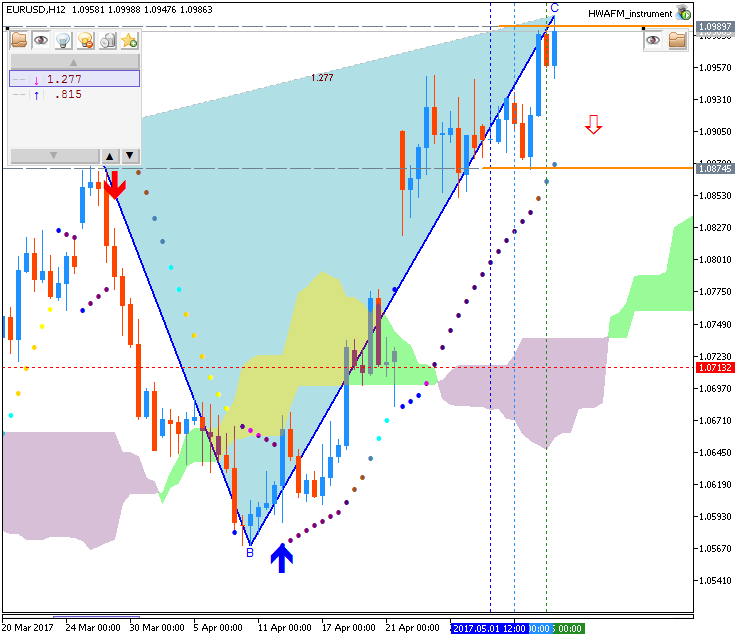 EURUSD finishes a strong week on its highs. It is speculated that hedges were removed as the French election nears and while Macron maintains a steady lead over Le Pen. Regardless of the reason, we look to the Elliott Wave pattern to help us identify higher probability patterns. 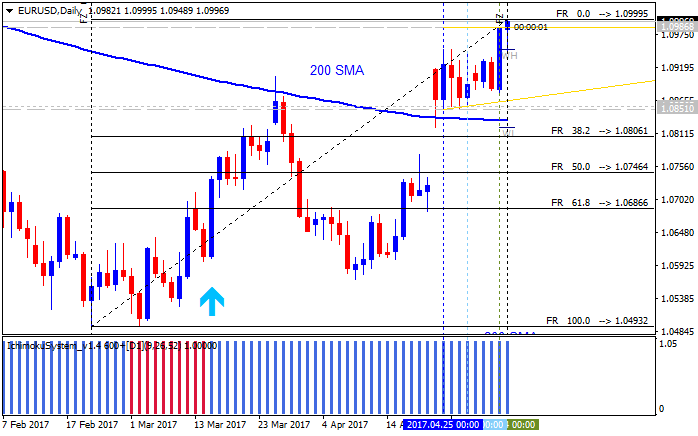 The EUR/USD advance is facing three technical hurdles. First, it currently sits on a trend line stretching back 12 months. Secondly, the 61.8% retracement of the previous impulse is at 1.1001. Thirdly, circle wave y is 1.618 times the distance of circle wave w. This is one of the common wave relationships regarding the distances of alternating waves.